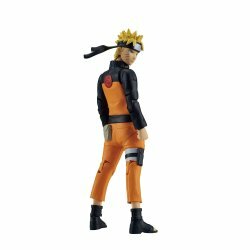 "Uzumaki Naruto" appears in Figure-rise Standard from "Naruto Shippuden"! * Magnet built-in "Magnetic Action" allows for ninja-like display such as sticking to metal walls! * Two facial expressions are "Decided Face" and "Laughing Face". Color separation is also perfect with part di..
* Two facial expressions are "Decided Face" and "Laughing Face". Color separation is also perfect with part division! * "Spiral circle" and "Effective parts such as" helical handshaft "are included. * If you remove the pouch and use a dedicated joint, you can support your posture with the included display base.